NENSA Women’s Day has come to Bolton Valley! The nordic center is bustling early this morning as we prepare for 200 women from all over New England to come join us for clinics and tours today. The Nordic Center is still open to the public, and we expect that that wonderful Nordic Solitude Phenomenon (you know, the one where it’s crazy in the Nordic Center, but peaceful once you hit the trails) will still be in effect. So come on over and ski, but don’t be shocked by the unusually strong female presence! Fred Hiltz, a great friend of Bolton Nordic and the guy who was responsible for gps-ing all of our trails. Late January Nordic Newsletter… here is the introduction. Click here to read the rest. 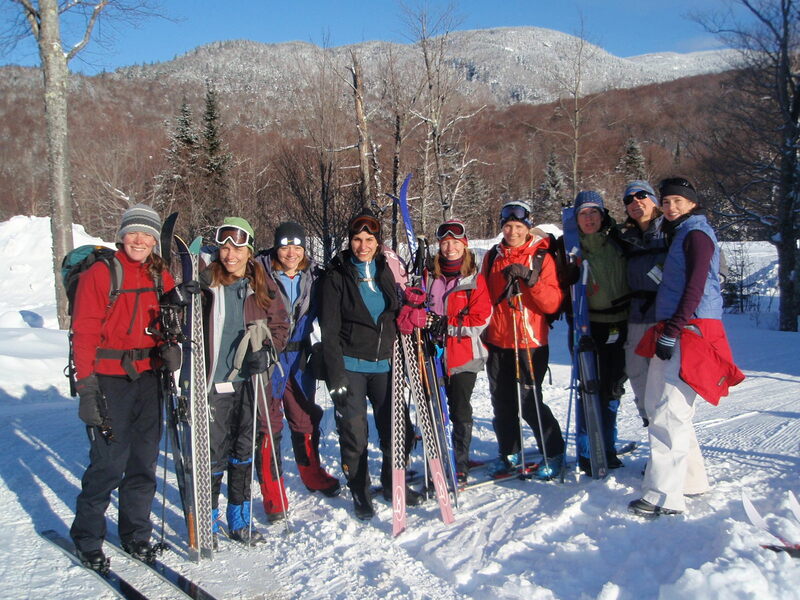 And email us if you would like to be on the newsletter email list- nordiccenter@boltonvalley.com. Heart of Winter! This is the best time of winter.. we have had lots of snow and cold temps in the past couple weeks. The skiing is wonderful. 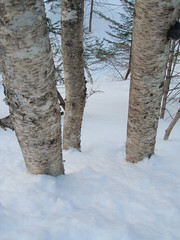 In the Nordic Gallery this month we have a display of photos by Sheri Larson. Sheri is displaying photos of skiing and a recent trip to Egypt. We have also been doing some restoration work to Bryant Cabin windows. Next time you ski by Bryant Cabin stop in and take a look. Upcoming projects include installing the 70 new trail signs that we made this fall. 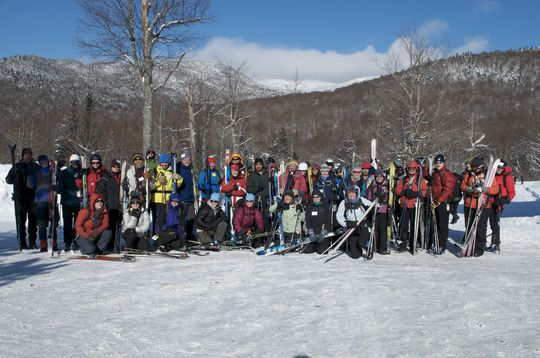 A hearty crew joined us last Sunday for the Get Out and Backcountry Festival! Temperatures hovering near 0˚ F didn’t deter over 70 participants from sharpening their backcountry skills at the 3rd Annual Get Out And Backcountry Ski Festival held at Bolton Valley on Jan 23, 2011. The sold out event, organized by the Catamount Trail Association (CTA), attracted skiers from 25 to 65 years old with three primary goals: to try out some of the latest in backcountry ski equipment, to learn skills to be safe and proficient skiing in a wilderness setting, and to have fun. 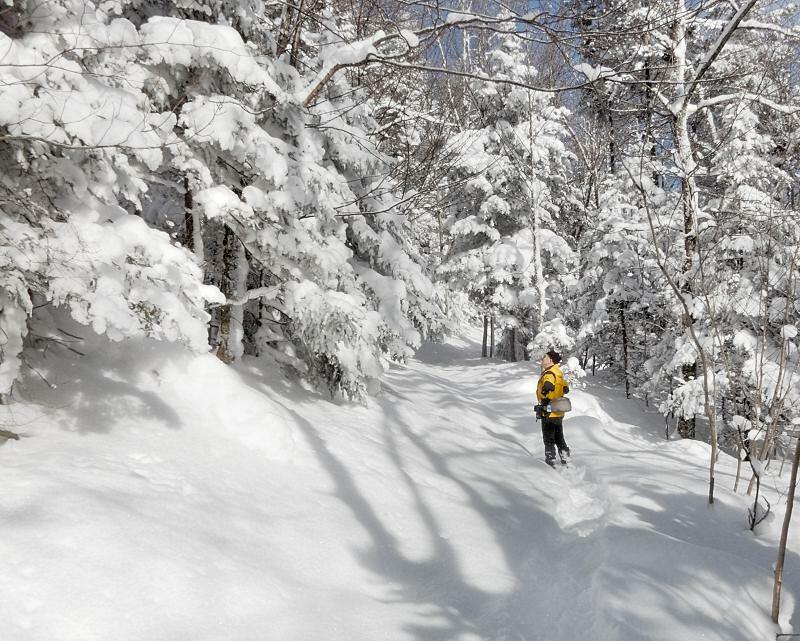 With over a 100 km of backcountry trails and an abundance of new powder, Bolton Valley Resort provided an ideal setting for the 3rd Annual Get Out and Backcountry Ski Festival. The enthusiastic skiers were broken up into groups based on ability and matched with instructors who shared and practiced skills appropriate for each group. From simple wedge and stem turns in powder to linked telemark turns on steep wooded terrain, everyone was able to boost their proficiency and confidence throughout the day. While the outdoor sessions were the main attraction, the workshop also included indoor talks on dressing and packing for backcountry excursions, and selecting proper backcountry ski equipment for one’s individual skiing goals. Culminating a perfect day, skiers were treated to a social gathering with beverages, Cabot cheese, Vermont Smoke and Cure Products, and an abundance of raffle prizes. A special thanks goes out to the SkiRack for providing demos and raffle prizes. We also want to thank Darn Tough Socks and the Outdoor Gear Exchange for providing raffle prizes as well. According to Snowsports Industries America (SIA) backcountry skiing is the fastest growing winter sliding sport. In their March 2010 Executive Market Summary, the SIA reports Nordic ski sales were up 18% in 2009/2010 over the previous year, and Randonee/AT sales were up 16%. This recent growth can be attributed to modern equipment and the numerous opportunities to explore backcountry throughout the country. 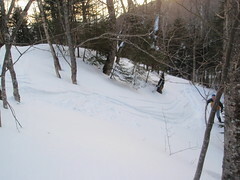 Vermont’s own Catamount Trail is a natural and recreational asset that attracts thousands of skiers from the Eastern US and beyond. 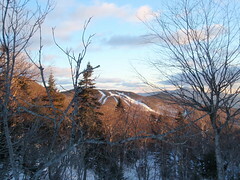 The 300-mile trail meanders the length of Vermont from the Massachusetts border to Quebec, offering a diversity of terrain from the gentle rolling hills of southern Vermont to the steeper hardwood forests of the northern Green Mountains. 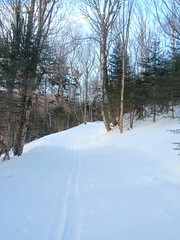 The CTA is at the forefront of backcountry skiing in Vermont and offers many Nordic skiing events including over 50 free, guided tours each winter. We hope you can join us on the trail soon! Generally service is available overnight. Tour/Race Binding Mount* $20 — Mounting of NNN, Profil or Pilot bindings. 3-pin Mount* $20 — 3-pin 75mm bindings with a separate heel piece. Boots needed for mounting. Basic Base Prep $15 — A thorough cleaning of the ski base, sidewalls and top. Finished with a coat of base or temperature specific wax. Ultra Base Prep $25 — Same as base prep plus 2 extra coats of wax and brushing and base finishing for the correct temperature. Ultra Backountry Ski Service $50 — Cleaning, major P-tex/ base repairs, edge tuning/sharpening and hot wax. Kick Wax Consultation— Complimentary with the purchase of a Nordic Ticket or Season Pass. *In the case of a remount (moving or replacing a binding), add $5-$10 to the normal mounting charge for binding removal, cleanup, and hole plugs. 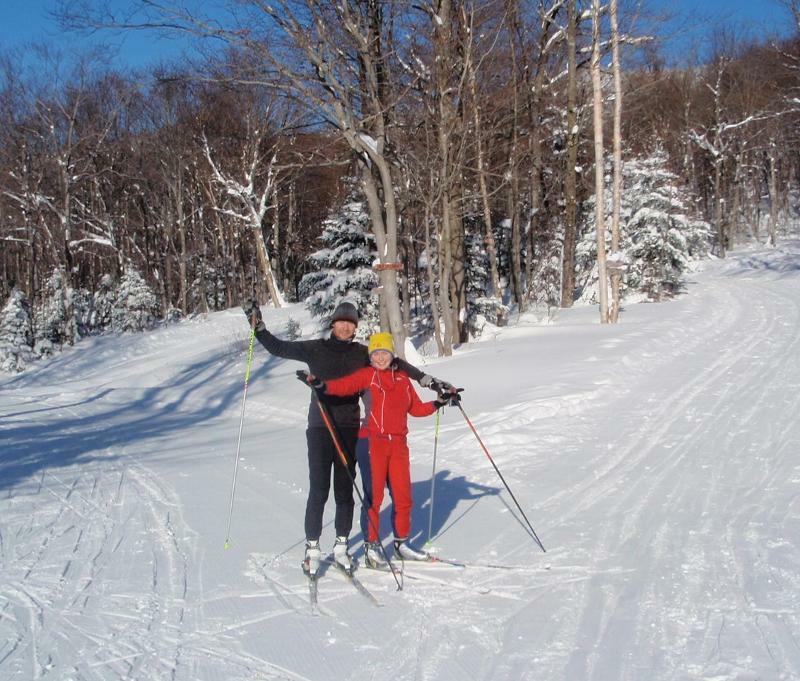 Our ski friend Mike Hussey is the new Nordic Dr at Rikert, the Middlebury College Nordic Center. Long -time Director John Rubright retired in the fall and Mike started in early winter. The Middlebury College Magazine Blog did a nice piece on the people of Rikert. Click Here And see if you can spot the couple photos that I took of Mike and his daughter at a BKL Race at Bolton last winter. This group of women got to Bolton bright and early Saturday morning.